It’s happened to the best of us. You’re out flying a great new drone you just bought, perhaps in a public park or a backyard. Maybe the wind picks up or maybe you just pressed the wrong button, and your drone ends up trapped in a tree. Now your expensive drone is stuck somewhere you can’t get to easily. What can you do when this situation arises? That’s what we’ll be talking about today. We’ll cover how to get a drone out of a tree using simple, everyday items. We’ll also go over more expensive solutions, as well as what NOT to do to get a drone out of a tree under any circumstances. It’s annoying how easy it is to get a drone stuck in a tree. Most consumer drones are just big enough to get trapped in the canopy and just small enough not to fall out. Add to that the design of most drones’ prop guards being VERY easy to get tangled in branches, and you’ve got a recipe for disaster. If you’re wondering how to get your drone out of a tree, here are four basic solutions that most people should be able to do with materials that are lying around their home. First, you can try to climb the tree in order to free your drone. This is obviously not possible in all circumstances – the tree has to be heavy enough to support your weight and have enough branches for you to get a good grip. You should also only climb the tree if you have a clear view of where the drone is stuck and of the path you’re going to take to climb there. Remember: you should always put your own safety before the safety of your drone. There’s worse things in life than losing some money on an expensive piece of tech. When climbing isn’t an option, you can always use a ladder. If you don’t own a ladder, you should be able to rent one from a local equipment store. Climbing a ladder is much safer than climbing a tree because you already know it’s capable of supporting your weight, but this option also won’t be very useful if you can’t see where the drone ended up. Remember to always have someone hold the ladder for you while you’re using it to reduce the risk of painful slips or falls. Using a ladder is a good option in most cases, but what if the tree has thick foliage and the drone is stuck deep in the branches? How can you get it out? Well, you can always try to use a long pole to carefully remove the drone from its entanglement. We do NOT recommend you try to knock the drone out of the tree for reasons we’ll cover in the next section, but many drones have propeller guards that you can hook a pole into if you know what you’re doing. A fibreglass pole is ideal for this sort of endeavor, but we know some dronethusiasts who have had luck with broomsticks, pool cues, or other long, flat objects. Just make sure it’s sturdy enough not to bend or break under the weight of the drone! Finally, if the drone has not run out of battery while it’s stuck in the tree, you can try to remove it by flying it out. 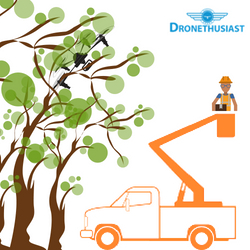 BE VERY CAREFUL if you attempt this method – if you don’t have a clear shot out of the tree, you might end up getting your drone even more tangled or breaking something by flying deeper into the branches. But if your drone is just perched on top of something and the FPV video view shows it has a reasonably clear path, this method of flying away may save you a lot of time and money. Using a fishing line to “throw the weight” of the drone is considered one of the very best ways to get a drone out of a tree, although it often requires purchasing additional materials and a little more setup than just finding a ladder. If you’re wondering how to get a drone out of a tree, what you’ll need is a strong kevlar-coated fishing line and a heavy weight (though it has to be light enough that it can be thrown a fair distance.) A baseball works nicely, as does a rock of about fist size. Tie the fishing line around the weight. Make sure it’s snug enough that it won’t slip off by giving it a test throw away from the tree with the drone stuck in it. Then unwind the fishing line and lay it in as straight a line as you can leading up to the tree. Having done all this, you should now throw the weight (with the line attached to it) over the part of the tree that your drone is stuck on. Be sure to throw to either the left or right of the drone – the last thing you want is to destroy your UAV with a baseball after going to all this trouble to try and get it down safely. Ideally, the weight should land on the ground and the fishing line should not make an upside down “U” over the troublesome branch or branches. Now, shake the fishing line carefully to try and cause the drone to fall. You can catch it yourself or – even better – have a friend there to catch it for you. Try to use different parts of the line as you shake so that you don’t break the wire. And if you feel like you’ve gotten a bad angle and the drone doesn’t seem to be moving, feel free to cut the line and throw it again. 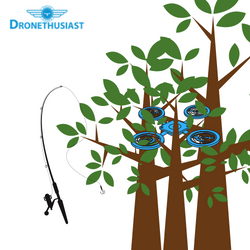 The fishing line technique works for many people who find themselves asking how to get a drone out of a tree, but it’s not a guaranteed solution. If your drone’s really tangled in the branches or the tree is very high or the branch the drone’s stuck on is too heavy to shake with fishing line, you’re going to need to consider a heavy duty solution. One thing you can try is an aerial work platform, also known as a bucket truck. This may be attached to a larger vehicle or may essentially be the size of a large, strange-looking ladder. But these heavy duty mechanical devices can lift you up into the air with ease and allow you to reach greater heights than you could on your own. Purchasing even a used bucket truck will probably cost you thousands of dollars. But many places will allow you to rent them for about $250 to $500 a day/ That may seem like a lot, but it’s cheaper than buying a new drone! A hydraulic lift works similarly to an aerial work platform and also may or may not be mounted on the back of a truck. The benefit of these sorts of personnel lifts is that they’re usually a lot cheaper to rent at an average of $150 a day. The downside is that they usually don’t go as high in the air and often come in awkward sizes that may be hard to line up with the tree. So if you’re wondering how to get a drone out of a high tree, you’re probably better off with the previous option. Just make sure that if you call the fire department you are VERY CLEAR about what your situation is and what kind of help you need. Claiming that it’s an emergency when it isn’t can get you in big trouble. In some areas, you may even end up serving a little bit of jail time! Just be clear with your intentions up front, and if the department says they can’t help you accept their answer and try something else. If you do a Google search for “how to get a drone out of a tree,” you’re going to find a lot of unreliable results. 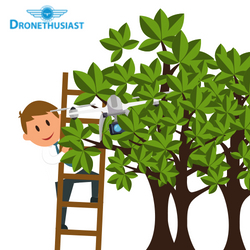 Here are some common things that people try to do to get their drone out of a tall tree, some of which are even recommended by other websites, which we at Dronethusiast feel you should not try under any circumstances. First and foremost: do NOT try to knock the drone out of the tree by force. At best, your drone’s going to take some damage when it falls. At worst, you may hit the drone and break it while it’s still stuck in the tree, making a bad situation worse. The odds of you catching it are slim and the odds of you breaking something are high, even if you use something that seems relatively safe like a foam dart gun. Some websites even recommend trying to use a slingshot, which is just asking for trouble! Try the fishing line technique instead. It operates on a similar principle to knocking the drone out but is a lot more gentle and a lot safer overall. Also: do NOT try to flood the drone out with a hose. Yes, this is a real “solution” that has been recommended online. And it’s a terrible idea. It won’t work unless you have a seriously high-pressure garden hose, and if you do have a high-pressure hose you’re going to cause serious damage to the UAV. In addition to the damage the drone might take when it’s hit or the damage it might take from falling out of the tree at great speed, most drones are not waterproof and the water will destroy the delicate electronic parts that keep the drone flying and taking pictures. Just don’t do it! Finally, do NOT try to rescue your drone with another drone. If you have an actual heavy lifting drone on hand and the drone’s at the very top of the tree with few if any branches covering it, sure, give it a shot. But in all other cases, don’t just send another drone to try and knock the first drone out of the tall tree. Not only is this yet another case of trying to knock the drone out with force, it almost ALWAYS leads to you having to rescue two drones instead of one. 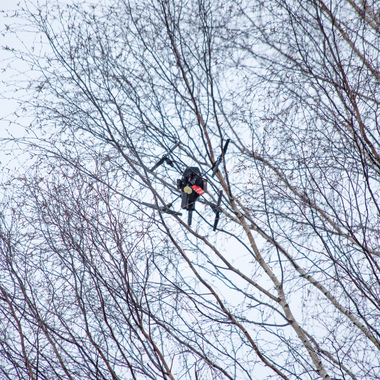 We hope that after reading this article you have a better understanding of how to get a drone out of a tree. Along with the DJI Phantom flyaway, this is one of the most annoying and potentially problems to deal with when you’re out flying quadcopters. If you’ve got a question or comment you want to add to the conversation, please be sure to drop us a line in the comments below! Ultimate Beginners Guide to Flying Drones, Start Flying Today!